If you don’t watch out, Mad River will thwack you in the face. Chances are, if you’ve skied the woods at Mad River, you’ve been thwacked – and then some. There’s more out-of-bounds skiing at MRG than there is in, and there are a bazillion rabbit holes you can duck into – if you dare. But you’ll want to keep your dukes up to keep the sticks back. If you do go in, stay light on your feet, because you’ll probably come up on a mandatory cliff huck. If you get back in line for the single chair after with bark in your teeth and twigs in your boot-buckles, you had a good run. That’s how they like it at the River. They don’t make much snow at Mad River. But they do make some around the base. (There are three guns!) And Mountain Ops are geniuses at snow harvesting and protecting the base once it’s built up. On a crusty day on a steep slope, for example, you might be asked to do some “human grooming” by side stepping the steeps. That way the next 2, 3, or 4” snowfall with gather in the grooves. Sometimes in the spring, Ops will leave some shovels on the side of trails for “volunteers” to shovel in the “bridges” from one patch to the next. They don’t use euphemisms like “packed powder” at MRG. If it’s icy, they’ll call it ice. If it rains, they’ll suggest you bring your slicker. They don’t groom much at MRG, but when they do, you know it’s absolutely necessary. At Mad River, they believe that ice bumps build character. You don’t like the ice-bumps? You’ll probably have to wait for it to snow again – and who knows how long that could take? At Mad River, all of the kids all rip it up. So do the seniors. MRG alumni are currently winning world freestyle championships. Kids’ ski school programs, race programs, and freestyle team are all top-notch. If you learn to ski at MRG, everywhere else is easy. One thing that makes MRG so family friendly is the size – it’s not a big area, and all trails lead to the base-box (as long as you’re on a marked one). The single line can get long on a good weekend, but it’s always easy to reconnect with your posse. By the way, Mad River doesn’t ban you, snowboarders; they only ban your equipment. If it suits your fancy, you can pick yourself up a pair of boards right there in the shop on the way in. 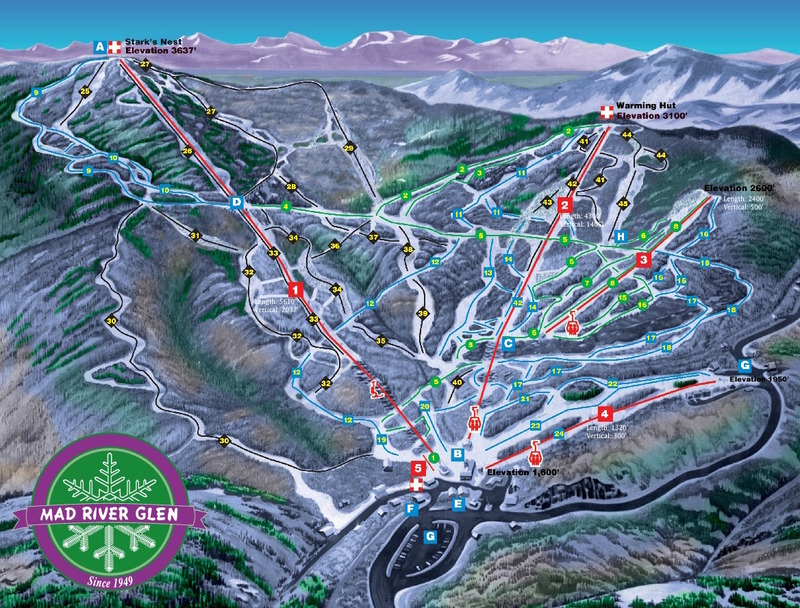 As the nation’s only cooperatively owned non-profit ski area, the shareholders continue to promote a two-planks only policy at MRG by convincing margins. Don’t hold your breath; get some skis! Mad River is famous as a telemark mecca. But at MRG, nobody cares if you telemark. Especially in the ski shop. Still, there aren’t any better ski-techs around, both in terms of wrench-handling and their unvarnished sarcasm. And yes, they’ll tune up your tele skis since better than half the regulars use them. Don’t expect MRG to change any time soon. When confronted with a deteriorating structure for the legendary single chair, shareholders overwhelming rejected a faster double chair in favor of refurbishing to old one. While other areas undergo massive zillion dollar “updates” every other year, Mad River routinely spends in the 100s to replace the foam seat-pads on the recently upgraded – yet pretty much the same –single chair. Maybe this is why MRG stays in the black. That, and the face-slapping woods experience.